My favourite risotto! I love the colour and I love the simplicity and I love the taste. Saffron is a wonder food to me, and the inclusion of it in this risotto was bound to win me over. And, just to name name drop a wee bit, the first time I had this was in Milan. Romantacising or not, who could argue that the setting could not be better. Actually that whole evening was wonderful, despite that we had arrived from Scotland via Heathrow without our bags, and as you might imagine, Milan is not the best place to feel shabby. One bag turned up the next day, the evening of which we found a fabulous neighbourhood restaurant, with all the atmosphere one could wish for ; the electricity went out whenever the coffee machine was used, the waiters were amazing and the food divine. 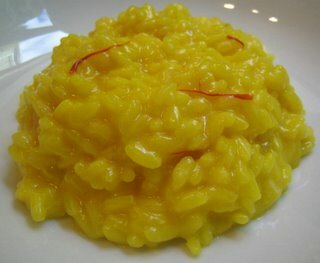 No wonder the risotto Milanese formed such a great impression. In my version I use marrow ; it adds such a wonderful unctuousness. If I am serving this with osso bucco then I will push the marrow from the bones before cooking and use it in the risotto. Bring the stock to a gentle simmer and add the saffron. Melt the butter and marrow in a large frying pan or shallow saucepan over a medium heat and saute the onion and garlic until soft. Add the rice and stir well to coat the rice in the fat. Add the white wine and stir until the liquid has been absorbed. Add a ladleful of the simmering stock and again stir until the liquid has been absorbed, but the pan is not completely dry. Continue adding the stock, a ladleful at a time until is all used and the rice is al dente. You may need to supplement the stock with water, or more stock and you might not use it all. Remove the risotto from the heat and stir in most of the Parmesan. Serve in warmed bowls, sprinkled with the remaining Parmesan. The best way to enjoy making this is with a glass of wine and someone nice to keep you company while you stir, although, alone with the wine, it is a lovely meditative half hour. I have made risotto literally dozens of times, but have never done a simple milanese. I love to fill mine out with vegetables. The saffron is so beautiful, though. I utterly agree with your final paragraph. I fully view risotto making as a simple pleasure. I'll have to agree with Julie as well. I make a mushroom one fairly often, but risotto is a dish that you have to just enjoy making at the end of the day. You are right with the wine , always a pleasure to sip wine while cooking... the best way I could think of enjoying a weekend. Just you and your wine and food - very peaceful!